Etchy.org Includes a nice gallery of other folks' attempts. At Etch-A-Sketch.com This one stopped working in mid-drawing last time I tried it. At ArnIIe - I like the "feel" of the controls on this one a bit better than most. From the ELF movie This one actually makes the little "skitchskitch" noise when you clear it, and it has an on-screen "print" button. Fantasy Game Character Name Generator - Many options! Enter your currency and see where in the world it's been and where it goes after you spend it. Cyborg Name Decoder Type your name and pick an avatar, and this site comes up with a cyborg acronym for your name and makes an image with it for you on the fly! You can order it on a T-shirt! 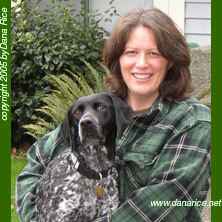 Also on this site - Romance Name Decoder and Monster Name Decoder. Doesn't this look like a real photo?! 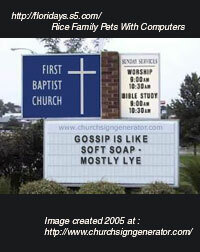 I found this web site where you can generate pictures of church signs with whatever text you like. I made this one with my fave quote from my Grandmother's church. Image created 2005 at http://www.churchsigngenerator.com/. You can order your custom church sign as a fridge magnet! This is not really a photograph! 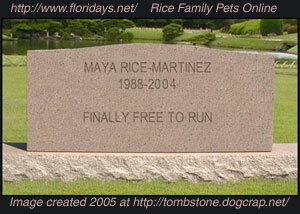 I found this web site where you can generate pictures of tombstones with whatever text you like. Check it out! Another goofball image! :-} There's this web site where you can generate fake Windows XP or 95/98 error messages with whatever text you like. Just don't give this site to your sysadmin! !